So I've had the iPhone for almost a year, and to my horror, I discovered I've become someone I told myself I wouldn't become: a complete iPhone addict. Despite my many attempts at using different types of technology to organize my life (my mom and a former boss both gave me early versions of the Palm Pilot at different points), I was never able to find the patience to use it to its fullest advantage. The iPhone has succeeded where many other devices have tried and failed. Recipe Storage: Between Evernote, which I use to clip recipes I see online, and my Epicurious and Mark Bittman apps, the iPhone has become a very handy device to use when cooking. While there are some minor annoyances, such as the screen going dark while I am trying to follow a recipe, I find that, for simple dishes, using the iPhone is a viable alternative to printing out a recipe, running back and forth from my laptop to my kitchen, or lugging around a huge cookbook. Checking Email: I am a self-proclaimed email addict, and I check email numerous times each day. I find it particularly important to check it in the morning before I go to work, so it is very easy to check my email before leaving the house (or sometimes even getting out of bed). Organizing My Life: This might seem like an overstatement, but as someone who used to carry around an actual calendar/planner (and, at one point, a New Yorker desk calendar), I can honestly say that figuring out how to import all of my Google calendars (and my boss's work schedule) into my iPhone calendar has made my life somewhat more organized. I love being able to have my calendars sync automatically, and I even found a way to import the Red Sox home schedule so that I know when to avoid the T and the Fenway area. As someone who dislikes crowds and sports, this is a big deal. Sketchy Coverage: Despite what At&T would like us to think, their coverage (particularly of the 3G variety) can be spotty at best. What is particularly annoying is that my phone sometimes refuses to work when I'm in my apartment. Although it would be easy to lay all of this at At&T's feet, I also place some of the blame on the iPhone, which can be temperamental when it comes to reception. Consequently, I am stuck with a seldom-used but necessary land line. Reading Un-Friendliness: Although part of me would love an iPad, if reading on it is like reading on an iPhone, I might have to pass. Reading on an iPhone is okay if I have nothing else to read, but if given the choice between reading on my iPhone and reading the text on paper, paper would win every time. Besides the sometimes inopportune readjustment of the text (it jumps from landscape to portrait), the backlighting can be tiring to look at. 24/7 Connection: I can appreciate being able to check my email, get the news, or make a call at almost anytime, but this comes with a price. I'm not quite sold on being connected all of the time. However, I don't usually turn my iPhone off. Even when I am teaching or at work, I will put it on silent, but I rarely power it down. I know that turning it off is an option, but part of me thinks, "If I'm paying for the unlimited data plan, then by God, I'm going to get my money's worth." Self-Loathing, Apple Style: I've always been a PC person, so I find it more than a little upsetting that I use (and love) my iPhone. If the iPod is the gateway drug to all Apple products, I'm scared that someday I will trade in my affordable Toshiba for a sleek, expensive new computer from the Apple Store. However, I think that the price tag (and the memory of those damn Apple vs. PC commercials) will be enough to deter me from going down that slippery slope. For whatever reason, I've been sort of a slacker this summer when it comes to reading new books. While I can blame my crazy schedule, I think that there is more to it than that. However, this summer has provided me with the perfect opportunity to revisit some of my old favorites as well as some books that I didn't love the first time around but thought they were worth revisiting. I didn't care for Prose's How to Read Like a Writer, so I approached Anne Frank with some trepidation. However, I found this book thoroughly enjoyable. Besides exploring the backstory of the diary and how it came to be published, Prose makes a convincing argument for appreciating the diary as literature, rather than just as a historical document. Learn pieces of trivia that you thought you knew. From knowing who coined the phrase "the survival of the fittest" (Herbert Spencer) to words that rhyme with orange (two proper nouns: Blorenge and Gorringe), this book serves as a reminder of just how much you don't know. It's a fun, diverting read, even if it does make you question your IQ. "American admire success. Englishmen admire heroic failure. Given a choice - at least in my reading - I'm un-American enough to take quixotry over efficiency any day" (p.24)"
I came to realize that just as there is more than one way to love a person, so is there more than one way to love a book. The chambermaid believed in courtly love... The Fadiman family believed in carnal love. To us, a book's words were holy, but the paper, cloth, cardboard, glue, thread, and ink that contained them were a mere vessel" (p.38). "I'd rather have a book [to read], but in a pinch I'll settle for a set of Water Pik instructions" (p.113). 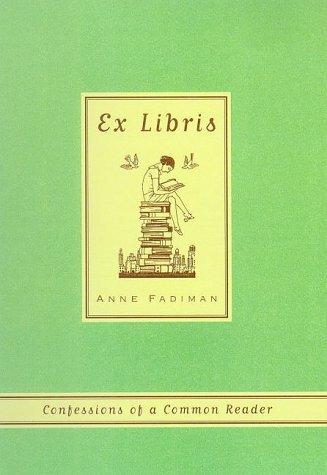 After Ex Libris, I tried reading another collection of essays by Fadiman. Although I started the book in 2008, I soon found myself occupied with other things (namely, my comprehensive exam), and so At Large and At Small was shelved, unfinished, until this summer. The essays are similar to those in Ex Libris, but the subject matter does not stop at books. Instead, Fadiman writes about her love of coffee and ice cream as well as the bittersweet experience of moving from a beloved New York apartment to a country house. While not as compulsively readable as Ex Libris, At Large and At Small is still worth a read. I know that I blogged about 1776 two years ago, it is definitely a musical worth revisiting. While it isn't perfect, there is something very moving about it. Here are two of my favorite moments from the movie adaptation. For more information on 1776, visit the musical's official web site.